We believe that innovation is a value, for companies and communities, therefore we are committed in contributing to develop new technologies, also in collaboration with research organisations. 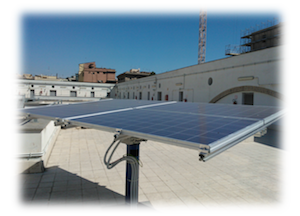 We take part in developing the Lab-eco projects of the Department of Computer, Control and Management Engineering of the University of Rome “La Sapienza” that, under the aegis of the Professor S. Monaco, is carrying on a small smart off-grid, where it is possible to converge and experiment a Sun tracking photovoltaic system, a micro wind turbine, with a local control of production, dispatch and consume of energy. As of May 2013, the ChiefTechnologyOfficer of B-ECO has held position as President of Photovoltaic Commission in the Association of Engineers of Rome, acting to promote and coordinate its works.